Pitz Foundry Inc. Baier Patent - Brooklyn, N. Y. When John Frederick Pitz (1874-1943) died in 1943 his obituary credited him with founding Pitz Foundry Inc. in 1910. The obituary (New York Times, 18 Oct. 1943, p. 15) reads in part, "John F. Pitz, manufacturer and retired banker, former president of the National Bank of Ridgewood, died yesterday at his home, 83-66 Abingdon Road, Kew Gardens, Queens, after an illness of three months. He was 68 years old. Mr. Pitz was president of the Pitz Foundry, Inc., of 288 Scholes Street, Brooklyn, which he established in 1910; also of the Loyal Textile Machinery Corporation and the Ames Hydrovac Corporation. He was president of the National Bank of Ridgewood for several years until its merger in 1931 with the Richmond National Bank." Actually the foundry at 288 Scholes St., Brooklyn, was called Pitz and Weber, and Pitz had a partner in the business, Joseph Henry Weber (1867-?). John F. Pitz, Inc., Pattern Makers existed first at 87 Frankfort St., Manhattan, in 1906. Joseph H. Weber was secretary in this corporation. The business name became Pitz & Weber in 1910, the same year a branch was opened on Scholes St. in Brooklyn. This had the address 287 Scholes until around 1920 when apparently the foundry was moved across the street to 288 Scholes where it remained until they closed in the early 1960s. The Manhattan location at 87 Frankfort St. ran from 1906 to around 1914/15. There was a short period when they had a location at 21-23 Rose St. (1918 to 1920), which may have been an office. And there was definitely an office for Pitz & Weber in the World Building (61-63 Park Row) from 1914 to 1918. John Frederick Pitz, age 43, registered for the World War I draft in 1918 when his occupation was "General Manager, Pitz & Weber Iron Foundry, Waterbury & Scholes St., Bklyn." In that same year the listing "Pitz, J. F., see Campbell Printing Press Repair Parts Co." appeared in the Printing Trades Blue Book, Greater New York and Surrounding Towns. Campbell Printing Press Repair Parts Co. (est. 1915), was located at 63 Park Row (telephone Beekman 1041). Its factory was located at 285 Scholes, Brooklyn (telephone Stagg 231), and its officers were J. H. Weber, pres., J. J. McKenna, treas., and J. F. Pitz, v.-p. They manufactured "Campbell press parts." The 1904 issue of the periodical Foundry (vol. 24, no. 4, June 1904, p. 182) contains an article by John F. Pitz entitled "Casting in Cores." Joseph H. Weber, age 32, was recorded in the 1900 U. S. Census living on Kosciusko St. in Brooklyn, N. Y. His occupation at that time was "Salesman, Printing." He joined John F. Pitz, Inc. at 87 Frankfort St. shortly after. His son, Joseph Henry Weber, Jr. (b. 1892), registered for the World War I draft in 1917 when he was a "Salesman, Pitz & Weber, World Bldg., NYC." In 1942 the same Joseph Jr., age 49, registered for the World War II draft when employed at Furness Lines, 57th St., New York. This ad for Pitz & Weber appeared in the Brooklyn Engineers' Club, Proceedings for 1917, Constitution and By-Laws and Annual Report of the Board of Directors, Brooklyn, 1918. The office was in Manhattan on Rose St., and the foundry was on Waterbury St. at the corner of Scholes, Brooklyn. On John F. Pitz's death in 1943, his son, Robert Guy Pitz (1900-1977), succeeded to head the company. Robert G. Pitz registered for the World War I draft in 1918, stating that he was born 13 July 1900, and that he was a student at Rensselaer Technical College, Troy, N. Y. His permanent address was the same as that of his father, 31 Hanson Place, Jamaica, N. Y. The Baier Patent on this manhole cover is possibly Ludwig S. Baier's patent number 2,488,796 "Scuttle Frame and Closure Unit" filed 20 Dec 1946. Baier worked mostly with marine inventions, but his mechanism for sealing a hatch on a ship was also applied to street manhole covers in order to provide a secure seal against water leakage. 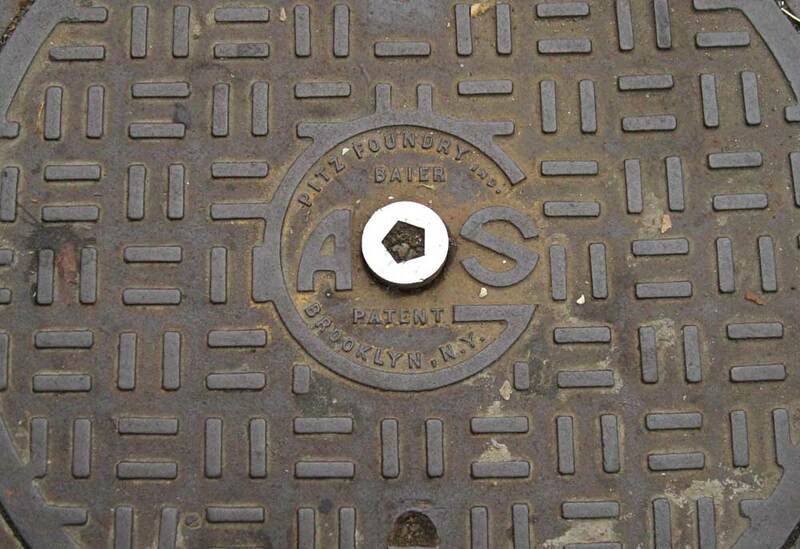 As for the G A S, Diana Stuart's Designs Underfoot: The Art of Manhole Covers in New York City, 2003, p. 21, shows three Pitz manhole covers, two of which have only "GAS" and not the Pitz name. Presumably, GAS simply means that the cover opens onto pipes carrying natural gas. This GAS cover is located on Highland Ave. near 165th St., Jamaica, Queens.